Green Warrior made a strong comeback after losing badly yesterday 1-6 and won both of their matches today convincingly. Today morning they defeated Snookin Shooters 5-2 and then ousted Black Panthers having similar score 5-2.. Team leader Alok Kumar won against Himanshu Jain of Snookin Shooters 67-47 in the first frame. After that Sundeep Gulati won next frame scoring one-sided 50-18 against Shahbaaz Adil Khan. Though the team Green Warrior lost the doubles frame of 15 red, but once again made a comeback in fourth frame of 10Red doubles to keep up the lead. The fifth frame went to Snookin Shooters where Amee Kamani clinched the frame from Ankit Kariwala, but after that Green Warrior did not give any loose string and won next two frames to secure 5-2 win. 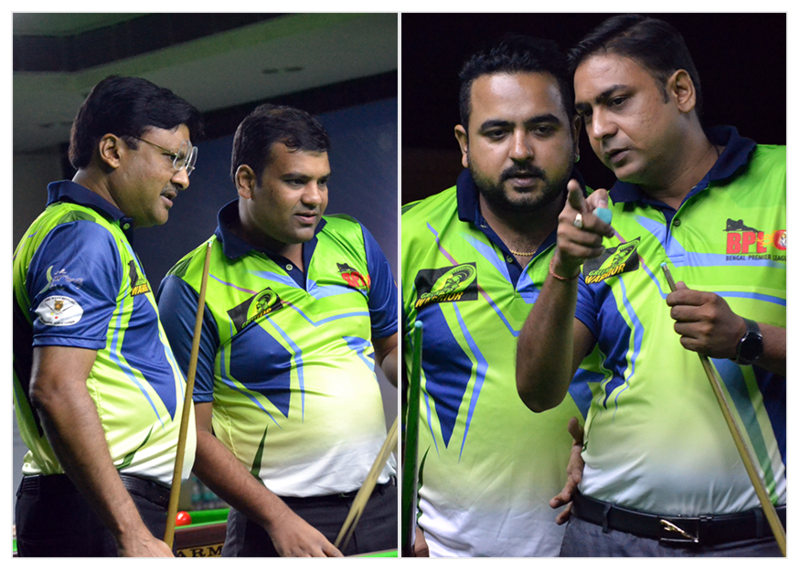 In the evening match, Sundeep Gulati clinched the frame from Aditya Mehta 72-38. Though after that Alok Kumar lost against Siddharth Parikh and the duo Sundeep Gulati / Ankit Kariwala lost to the pair Siddharth Parikh / Rajesh Tulsian, but in subsequent frames, Green Warrior dominated and taken away rest of the four frames to win 5-2. Shooting Stars played their second match of the league and won that after losing yesterday. Today they beat Cue Magicians 4-3. Their player Faisal Khan opened the account on winning node against world champion Manan Chandra 73-20. His team-mate Akshay Kumar equally complimented him and won the next frame against multiple time West Bengal State Winner Manish Jain 64-20. Soon Shooting Stars were leading 3-0 but after that they lost back-to-back next three games to come at par. However, in the deciding frame, the pair of Faisal Khan and Akshay Kumar, once again controlled the game and won the match 4-3. At the end of the day, City Knights leading the points tally followed by Green Warriors, Dream Chasers and Snookin Shooters for top four positions.